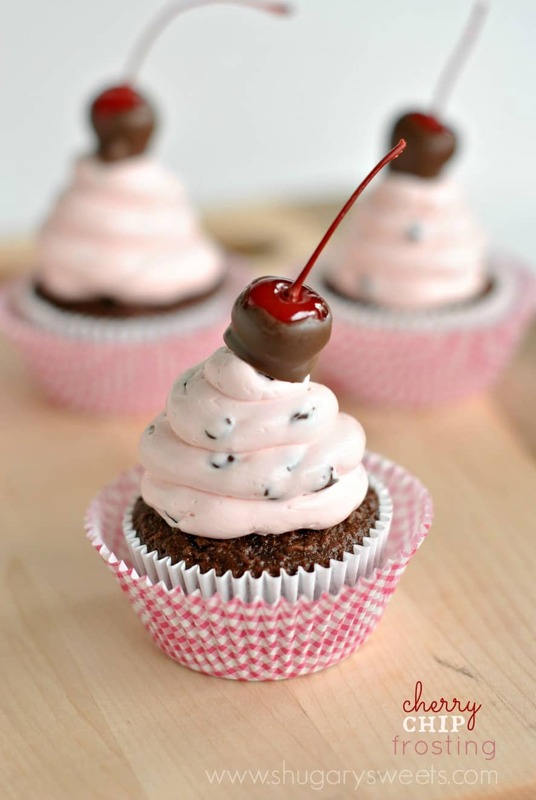 Cherry Chocolate Chip Swiss Meringue Frosting, Dark Chocolate Cupcakes and a Chocolate Covered Cherry. Need I say more? Do you have any idea how long it’s been since I shared a cupcake recipe? September 2013. I’m sorry. That is completely unforgivable on my part. I hope I can make it up to you all. Will this Cherry Chocolate Chip Cupcake help? I’ve actually been keeping a bit of a secret for the past year. Nearly one year ago I wrote a cookbook proposal. A cookbook all about FROSTING. I wrote over 70 delicious, mouth watering frosting recipes. Sent my proposal to my agent. And several weeks later….sweet Courtney from Pizzazzerie announced her cookbook. The most beautiful cookbook…called FROSTINGS. So my friends, one year later, my agent and I came to the decision that we don’t want to compete, obviously, and we cancelled the contract. Which I feel slightly relieved. I had no idea Courtney had been in the works creating a cookbook with the same topic, and I didn’t want to release one with the same topic, so soon after hers hit the shelves! This my friends, is great news for all of you. Great news because I now have 70+ frosting recipes to share here on Shugary Sweets, hehe!!!! I promise to space them out some and not send you all into a sugar coma! I’ve been crazy excited the past couple days, trying to decide which frosting recipe to share first. I finally closed my eyes and drew a name. 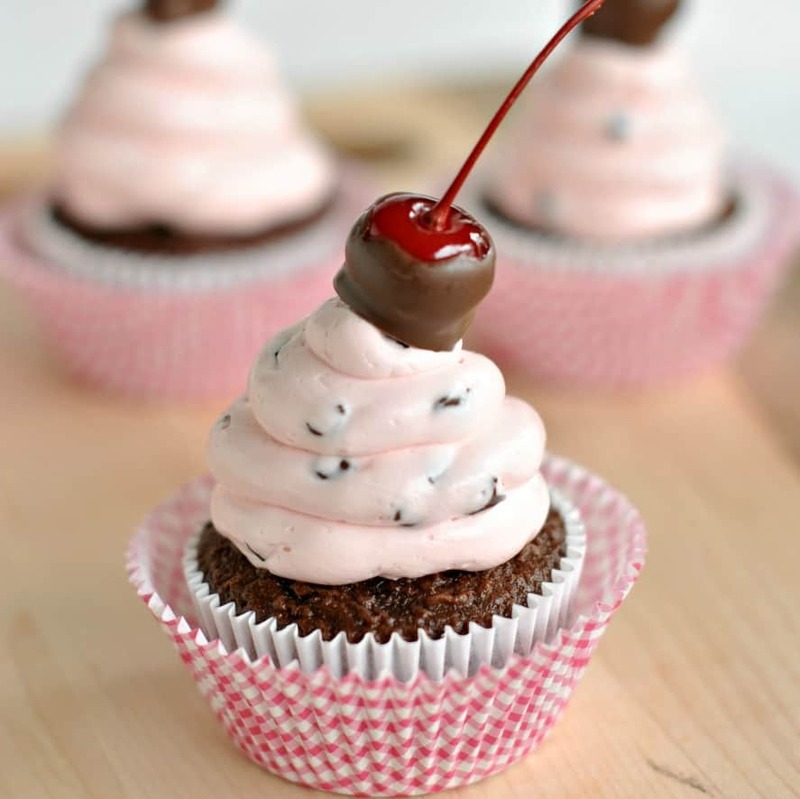 Cherry Chocolate Chip Swiss Meringue Frosting. If you’re new to Swiss Meringue style frosting, don’t be afraid. It may seem intimidating, but read through the directions before starting. It’s such a smooth, buttery frosting and it’s perfect with the cherry and chocolate. 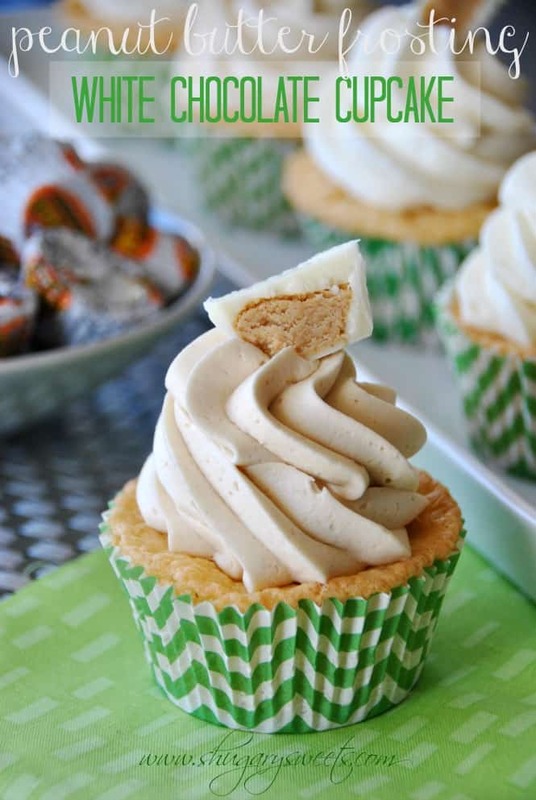 You may remember this Salted Caramel Swiss Meringue frosting from awhile back. Both are awesome. 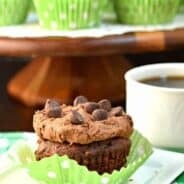 I used my favorite dark chocolate cupcake recipe as the base for this delicious cupcake! ENJOY! 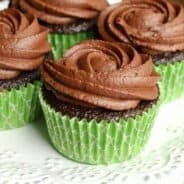 Prepare 24 chocolate cupcakes (either from scratch using the recipe in THIS post, or use a boxed mix). Cool completely. Heat a small saucepan with one inch of water, bring to a boil. Once boiling, turn down to a low simmer. Place a heat safe mixing bowl over the simmering water. Add egg whites and sugar to bowl, whisking until combined. Attach a candy thermometer and continue whisking over simmering water until temperature reaches 145 degrees F.
In a clean, dry mixing bowl, attached to a stand mixer with whisk attachment, beat egg white mixture on medium speed until doubled in size and cooled. This process takes 6-10 minutes. Slowly beat in butter, 1-2 Tbsp. at a time. Keep mixing until all butter has been added. It may appear curdled, keep mixing. Add salt slowly and add cherry juice. This process takes an additional 8-10 minutes for the addition of butter and juice. Fold mini morsels into frosting. To pipe onto a cupcake like the photo, use tip 1A. Pipe in circles, swirling upward like an ice cream cone. To make chocolate cherry garnishes, use maraschino cherries with stems attached. Melt 2oz chocolate candy coating in microwave in 30 second intervals until smooth. Dry the cherries on a paper towel and holding the stem dip each cherry into the melted chocolate. Place upright on a piece of parchment paper. 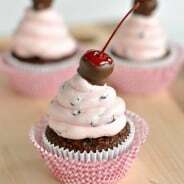 After frosting each cupcake, top with a chocolate covered cherry. Recipe makes enough frosting for 18-24 cupcakes, or a 2 layer 9inch cake. Here are a few of my favorite recipes…. 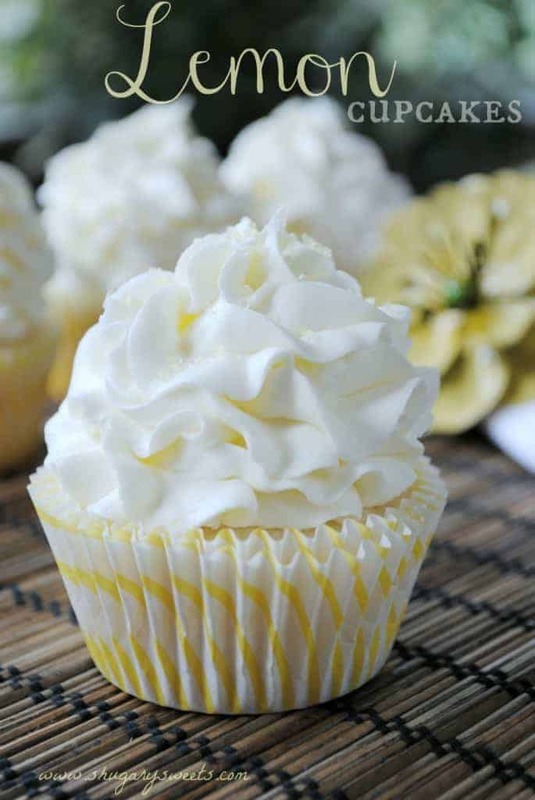 Lemon Cupcakes with Lemon Buttercream. One of my most popular recipes. One bite and you’ll understand! 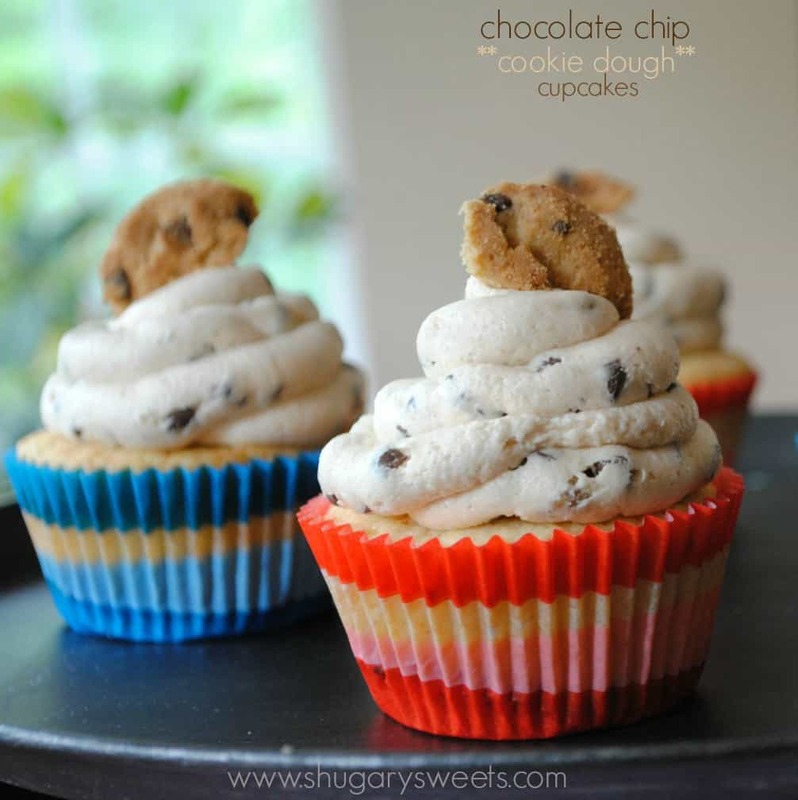 Chocolate Chip Cookie Dough Frosting…yes, frosting that tastes like cookie dough!!! Oh Aimee I think it would of been a wonderful book that I would of bought! You amaze me at what a gracious spirit you have I know it probably was disappointing for a while!! These cupcakes sound amazing!! I’m sorry about that book idea not working out, but yay for us! These are fabulous. So pretty too! Thanks Kari 🙂 You tell me what to bring, can’t wait to see you guys…its been forever!! Sorry to hear about your book Aimee, I think it would have been fantastic! 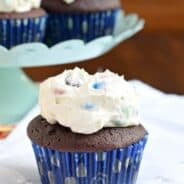 I love frostings and my favorite is Swiss Meringue too – yours looks amazing on these cupcakes especially with all the cherries and mini chocolate chips! You are such a sweetie to graciously give up the cookbook at this point! But yay for all the fun frostings that will coming at us soon! I love your frosting to cupcake ratio…just the way I like it too! These are so pretty and that frosting is amazing sounding! I am new to your website. I am drooling over this particular cupcake and look so forward to getting all your frosting recipes. I make cupcakes for special events and am always looking for THE best frostings around…I think I have found them. I am sad you didn’t get to do your cookbook. It seems you have a very kind heart for others and looking out for their best interest at heart. I would have bought the cookbook..but, instead I will follow you on here and enjoy all your wonderful recipes you are willing to share for free. Thank you, for you are amazingly talented and kind spirit..looking forward to seeing more of you awesome creations. Thanks Lynn, so glad you found me!! Be prepared for lots of sugar! What a bummer after all that work! At least you have a stock pile of recipes now which we all are jealous of 🙂 This frosting looks amazing! Sharing on FB & Pinned! It is a bummer…but on the bright side, all the future work of cookbook creating has been avoided 😉 Thanks for sharing Julie! Seventy… I am wicked excited to see these creative frosting recipes. If they’re anything like this one, then they have to be epic. Love this cupcake! Pinned. I believe it’s actually 74. Or 76. Something like that 😉 Thanks for pinning! Mmmm….can I skip breakfast and go straight for these this morning? These look so darling! And I love the frosting idea. So excited to see all of your frosting recipes on here!! And this one is just absolutely perfect. I mean, died-and-gone-to-heaven perfect! I’m sorry about the book, bummer! But I can’t wait to see all the recipes! These look delicious! Swiss meringue buttercream is definitely not as scary as it looks and oh so smooth! That’s such a bummer that somebody beat you to the frosting cookbook! It really is nice that we get to see all of them here, although I would’ve bought your book. haha I love that Swiss meringue looks fantastic! omg these are too cute. i love the frosting! Oh my, these are gorgeous! How decadent 🙂 I am dying to get my hands on one! Aimee, I’m really sorry about your cookbook, it would be really great to heave your amazing frosting recipes at on place, but still looking forward to see on your blog what great recipes you’ll be making . I’ve featured this yummy frosting on my blog, hoping that you don’t mind, but if you do, please contact me and I’ll remove it. All the best.